Review: 'The Crimes Of Grindelwald' Is Less Muddled, More Dutiful The second installment of J.K. Rowling's follow-up Potter franchise is as overstuffed as the first, but it's less muddled. It dutifully advances the story, but fails to deliver thrilling set-pieces. 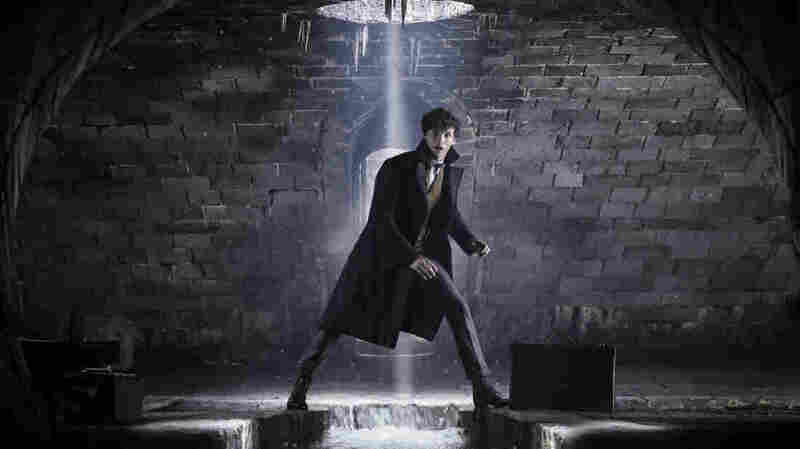 Back on my beast: Eddie Redmayne returns to his old, squirrelly tricks as Newt Scamander in Fantastic Beasts: The Crimes of Grindelwald. Hands up, everyone who liked the Harry Potter series — books and/or movies — at least well enough. OK, well, that's a lot of you. Keep them up if you made it all the way through 2016's Fantastic Beasts and Where to Find Them — a prequel to the canonical Potter stories, in which Eddie Redmayne played magizoologist Newt Scamander, who came to New York City in 1926 with a magical valise and an annoying, squirrelly affect. Hunh. Thought that would eliminate more of you than it did. Okay, now only keep them up if you came away from Fantastic Beasts disappointed. If you liked the setting — the so-called Wizarding World, U.S. edition — but felt the story a meandering, muddled, overstuffed mess that leaned too hard into the cutesy-wutesy magical critters. If to you it captured some of the stylistic flourishes of Harry Potter, but none of the distinctive particulars, none of the feel, none — let's just get this out of the way — of the magic. Okay. Now. If your hand isn't up, you're excused. This next bit isn't for you — you either don't care about J.K. Rowling's world, or you're so devoted to it that you managed to ignore the fact that Fantastic Beasts was a cinematic Obscurus — an noisy ball of violent, nonsensical narrative chaos, albeit one that did boffo B.O. So off with you. Everyone else? The ones still sticking around? Here's the scoop. Once again: Structurally, it's familiar, not, you know: good. Can we all admit, here, that the plots of Harry Potter books and movies were always frustrating in the extreme? Rowling's characters delighted in keeping vital information from Harry — and by extension, the reader — turning every tale into an ersatz, low-rent mystery where the goal was never to uncover whodunnit, but to eke out even the most basic understanding of whatthehellsgoingon? Inevitably, we'd discover the answers — well, "discover" is inaccurate. We'd be told, when Rowling would finally sit Harry down to have him listen to an extended monologue, filled with secret history to which neither he nor we could have been expected to be privy. That's the kind of plotting The Crimes of Grindelwald serves up, down to a hilariously out-of-nowhere pseudo-climactic scene in which characters who've spent the movie scheming to murder one another just stand around listening patiently to a series of monologues like they're sleepy kindergartners at storytime. No, it doesn't work. No, it's not, not even a little bit, good. But it's familiar. It's actually an improvement, in a very small, specific way. You'll recall that all of that information was kept from Harry and his friends because no one tells kids anything, forcing them to glean any and all actionable intel via that most overused trope in all of kid-lit: eavesdropping. Magical eavesdropping, to be sure, but even so: They'd learn something, jump to the wrong conclusion, and proceed to labor under that misinformation until the penultimate chapter, when someone (usually Dumbledore) would finally explain the situation in full. Rinse, repeat. Accio annoyance. There's none of that here, at least. Eddie Redmayne's Newt Scamander is an adult, and he finds things out using magic. There's a cool sequence when he reconstructs a crime scene using a glittery gold magical powder — pixiedusting for fingerprints, as it were. This time out, the sheer number of putatively hilarious beasts on hand is dialed mercifully back, but the ones who do turn up tend to be used strategically, to bring about some concrete result, instead of simply as a means to up the film's Whimsy Quotient. Redmayne's performance, as Newt, remains just as mannered and tic-ridden as ever. But thanks to a brief flashback sequence featuring a teenage Newt played by Joshua Shea, who gamely matches Redmayne's every furtive head-tilt and skittering glance, it seems less hammy and indulgent, and more a defined, characterizing choice. Of course, one of the main reasons that Grindelwald works better than the film that preceded it is a function of its status as the middle film of a trilogy. The business of world-building, which the first film made such a corned-beef hash of, is over, and now there is only the task of moving the various characters across the board like the Wizard's Chess pieces they are. As such, it has a more singular sense of purpose, as all the meandering subplots of the film's first hour eventually lock in place and fit together. Also there's love-interest stuff: Newt and his Auror girlfriend Tina (Katherine Waterston) are on the outs over a misunderstanding that could be clarified with a ten-second conversation, but isn't, because Rowling gonna Rowling. Newt's pals Jacob (Dan Fogler) and Queenie (Alison Sudol, doing a lot with one of the film's many underwritten roles for women) show up, as well, and the script puts them through some clearly defined changes that at least feel like narrative progress. The film's chief problem is Grindelwald, a dull-as-dishwater villain we're repeatedly told is charming and deceitful, although Depp's performance fights hard against any such reading. The character of Grindelwald is supposed to use guile and rhetoric to win wizards to his side by promising them the chance to "live openly, and love freely" — a not-particularly coy attempt by the screenplay to underline the gay subtext between Grindelwald and Law's Hot Dumbledore — but Depp just hams it up like a Pantomime baddie. Everything about the guy is second-rate. Voldemort had disquieting slits where his nose should be; Grindelwald a single, discolored iris. When Voldemort summoned his followers, a leering skull with a snake slithering through its eye-sockets manifested in the sky: that wizard had style. When Grindelwald attempts the same move, the buildings of Paris simply get shadowy tarps thrown over them; it's unclear if he's calling an army or renovating masonry. So, now. All of you who stuck around? Relax. Grindelwald is a better, more purposeful and thus more propulsive film than the first, and it does possess its unique charms: Several characters only alluded to in the Harry Potter tales pop up here, goosing appreciative gasps from the audience in the process. The sight of Hogwarts, accompanied by John Williams' familiar fanfare, elicits applause. And not for nothing? Law looks great as a Dumbledore in bespoke tweed (Fantastic Vests and Where To Find Them! ), even if seeing him so put-together evokes a twinge of sadness at the shapeless robes and chunky jewelry that we know lie in his future, just waiting to turn him into the Wizarding World's equivalent of a Santa Fe gallery owner named Jade.